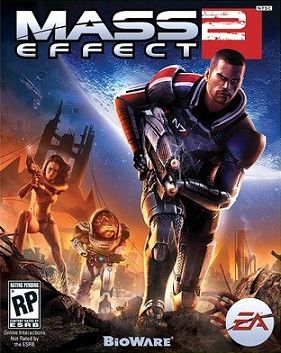 The game is the sequel to the best-selling Mass Effect, and focuses on the continuing adventures of Commander Shepard, learns that entire human colonies are mysteriously vanishing. Shepard must team up with the human supremacist organization Cerberus in the investigation, and journey across the galaxy. The game itself has a unique selling point in that saved games from the original can be transferred into the new game, allowing gamers to continue the arch from that game. Decisions in the first game impact how events unfold in the sequel. That is not to say that new gamers can’t just start with this one, as the game is complete in and of itself. Personally I loved the original, and I’m currently deeply involved in Bioware’s latest Dragon Age: Origins. The company have a long lineage in RPGs, having created Baldur’s Gate, Neverwinter Nights and Star Wars: Knights of the Old Republic, and this game is shaping up to be one of the highlights of the new year. I still prefer the first box art though. This entry was posted on Tuesday, November 17th, 2009 at 8:31 pm and is filed under Videogames. You can follow any responses to this entry through the RSS 2.0 feed. You can leave a response, or trackback from your own site.